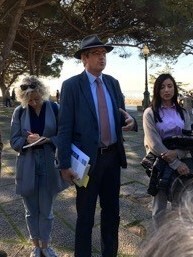 Today we start our tour of the Moorish or Islamic walls of Lisbon with two highly knowledgeable guides : Dr. Santiago Macias from the Department of Archeology of the University of Coimbra and Dra Teresa Machado, with whom you have now become familiar as she has expertly guided us on several outings throughout the city of Lisbon. We are reminded that it was in 711 that the Iberian Peninsula came under Arab rule – which lasted until 1250 in Portugal, with the re-conquest of Faro, and over 200 years more in Spain - up until the re-conquest of Granada in 1492. The Arab legacy has enriched both countries for ever and shaped Portugal as we discover it today. 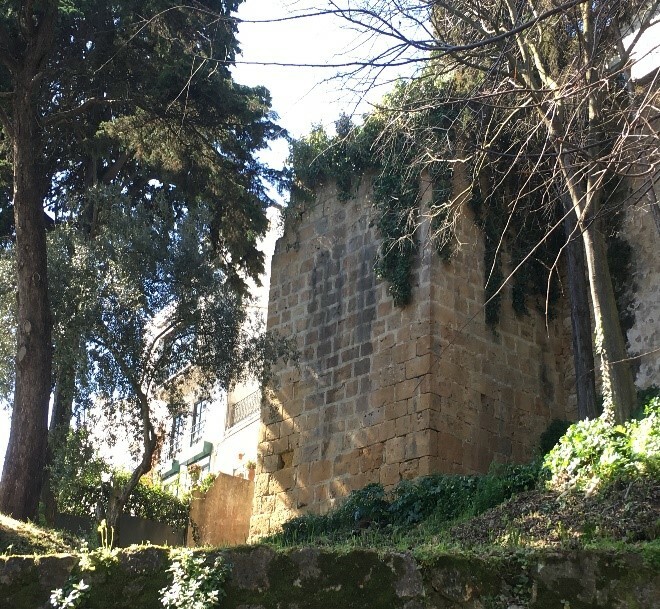 We are gathered here at the entrance of the Castelo Sao Jorge to visit the defensive walls of a specific period of the City – the Islamic or Moorish walls. 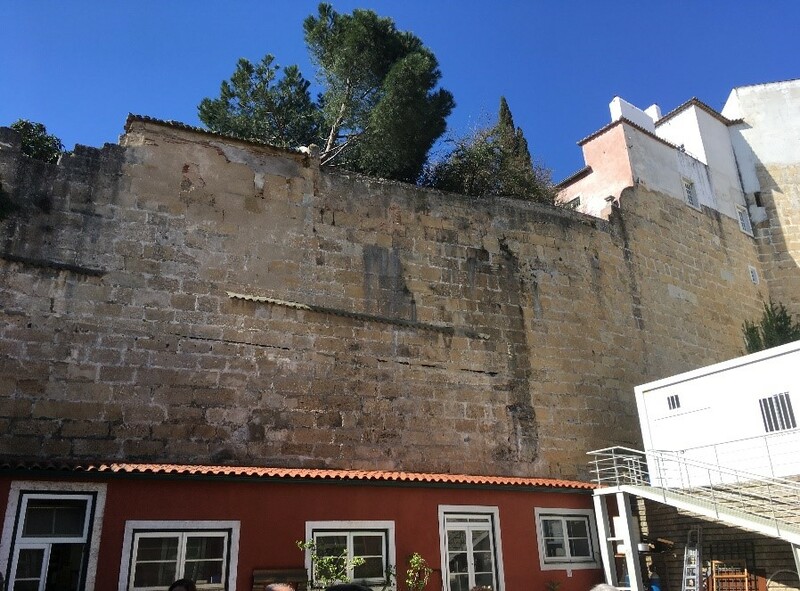 These walls, over the centuries, have, in many parts, been integrated into more modern buildings such as the Mosques, which were built by the Moors at the same time as the walls (11th/ 12th century) and then re-used to build Churches as Christianity progressed south from Lisbon. The weather is magnificent and we have only to close our eyes and listen to the voice of our guides and let our imagination wander: is it not Fado that can be heard in the far distance? Surely not at this time in the morning, however the music serves well to set the scene: the plucking of the strings on the mandolin and guitar is similar to the strumming style that Arab musicians use on the fretless “ud”, the ancestor of the lute of the European Renaissance. In Fado, repetitive forms are also frequent like early Arab “muwashshaat”, where a phrase is repeated over and over. We have only to hear the sounds of the modern-day flautist Rao Kao to be both here today ... and there – back in time. 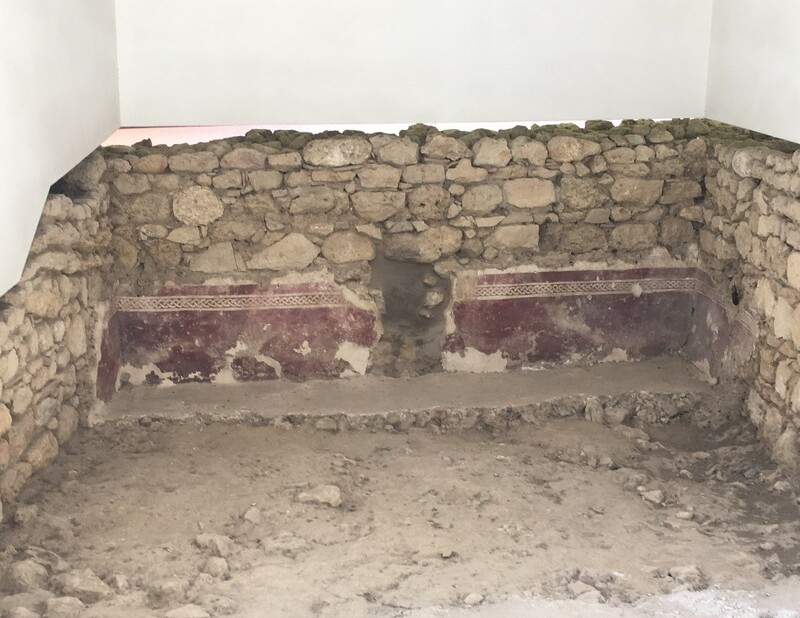 In the Castelo Sao Jorge we visit excavated Moorish houses and see the remains of mosaics, interior patios, and even cesspits. Dr. Macias points out two of the several Moorish cemeteries, the earliest being at the site of the Igreja da Santa Cruz and the main one at the site of the Mirador do Santo Antão. He explains that, according to Arab tradition, the Moors were buried lying on their side, facing south, whereas Christians were buried lying on their back, facing the sky. Next we head on up into Graça, and then next-door to the part of Lisbon known as Alfama. We are now walking through the truly “Arab part” of Lisbon – actually straight into the courtyard of the 17th century palace that houses the present-day “Fundação Ricardo Espirito Santo”, with its world-famous school for restoring antique future, paintings, and fabrics – where we are shown the outline of the largest surviving section of the wall of the alcáçova (fort), which has not changed since the Moors built this section of the city that they called Lishbuna (with a population of around 5,000, half of whom were Christians) - when Cordoba was the capital of al-Andalus and its counterpart- in southern Portugal was called Silves. 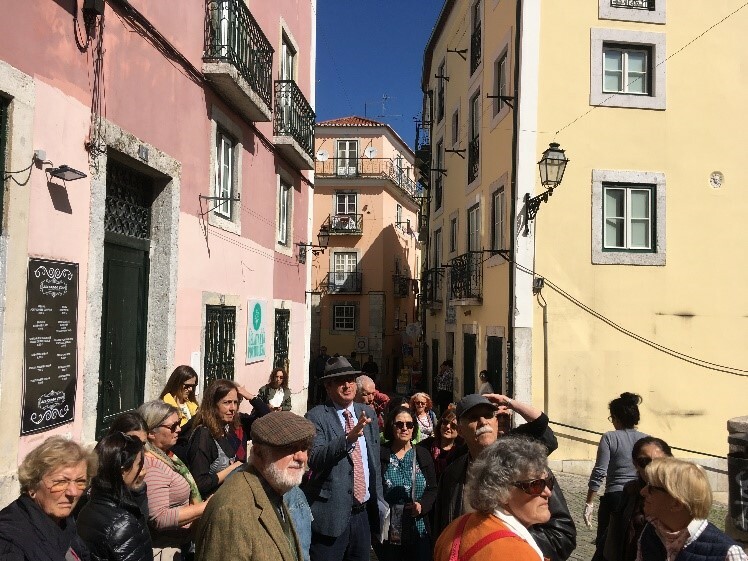 Indeed as we walk through the streets, up narrow stairways, across shaded “praças”, we understand how the Arabs largely contributed to the Portuguese language, architecture, and even to the knowledge of navigation. The lateen sail and the astrolabe, introduced by the Arabs, were instrumental in launching the Portuguese nation into its Age of (Global) Discovery. On we go, heading downhill, into a town already bustling at this early hour beneath its hilltop Arab castle, a testimony still today to the Arabs' brilliant legacy of “convivência”: a peaceful cohabitation of learning, innovation and culture that shaped the European Renaissance and goes on shaping the lives of the people who live there today. Though it was founded by the Phoenicians and later embellished by Romans and Visigoths, the Arabs gave its name to the Alfama neighbourhood, which comes from al-hammah "hot spring " or thermal waters. Amid narrow, cobbled streets that follow the Arab platting, and among the complexity of close-quartered whitewashed houses and flowered terraces, the aura of the long gone Muslim city still lingers. Climbing plants and stone vases still sprout plants in courtyards, and all appear to have more in common with North Africa than with modern-day Europe. One Arab decorative tradition that has endured to become part of modern Portuguese identity is the love of vivacious ornamental tiles, the azulejos. The word comes from Arabic al-zulayi, "polished stone." These colourful - often geometrically patterned tiles seem to bring out the beauty of every building they adorn. Tiled walls in every city and village harmonise with Portugal's baroque and Manueline architecture, the latter having been developed largely by Francisco Arruda, an admirer of Arab artistry and one of Portugal's finest architects in the period after the Age of Discovery. 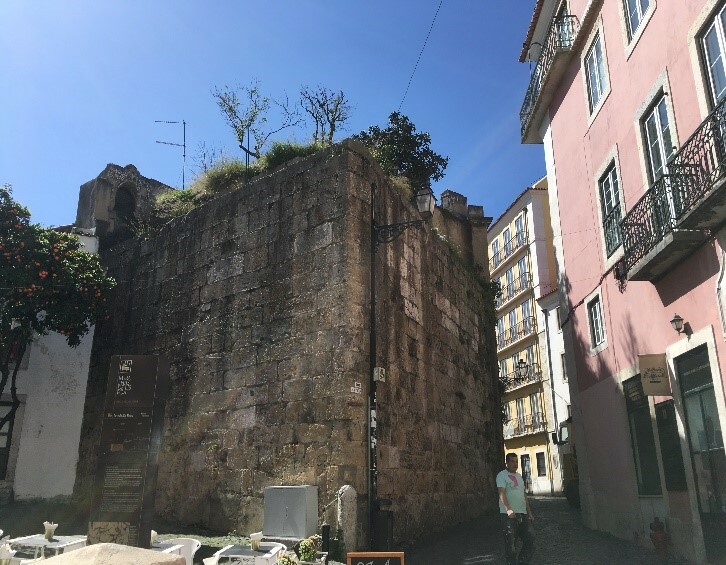 Next we walk past the site of some of the gates of the Moorish walls, namely the Porta de Alfofa (Rua do Santiago) and the Porta do Ferro, near the Sé (Cathedral). 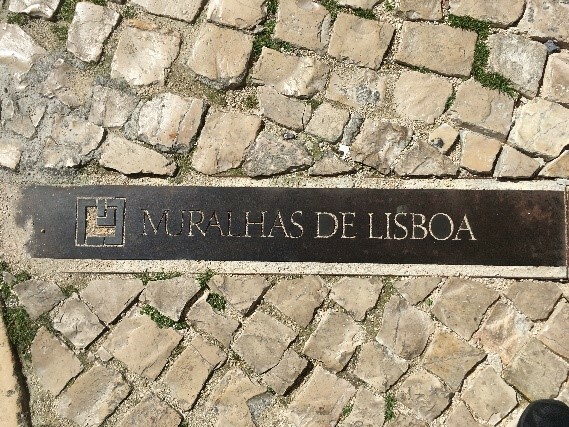 At the site of what would have been the Porta da Alfama we step over the metal strip which marks the boundary of the original Moorish walls. 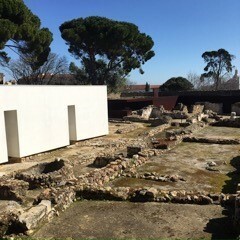 We finish off our walking tour in front of the ‘Casa dos Bicos’ in the Campo das Cebolas, where Dr. Macias explained that there used to be a beach, from where the German and English knights made their final assault on the Moorish walls in 1147, after having used a 20m high siege tower to catapult up to 5,000 stones a day. They shouted “Maria, Maria, Boa Maria” as they swarmed into the city, and amongst other atrocities, they cut off the head of the Christian bishop and impaled it on a stake. Four days of negotiation ensued before the Moors capitulated, with many of the survivors being permitted to relocate outside the walls to what is now known as the ‘Mouraria’ neighbourhood. Three mosques are known to have stood at the current sites of the Sé, the Igrega da Santa Cruz, and the ‘Rebalde’, in the Rua da Conceição and the Moorish cemetery moved to near Arroios, at the end of the current Avenida Almirante Reis. It is well worth visiting the website of GEO (Gabinete de Estudos Olisiponenses) to download the brochure produced by the Câmara de Lisboa: geo.cm-lisboa.pt/. These books below are well worth reading to get an ever better understanding of how all the periods of Portuguese History mingle and, in the field of architecture, how the stones from one era were then used to build public buildings or private houses, churches, or even cemeteries - which today still contain the tombs of the different communities – and have done so for many a century. António Jorge Coelho – Portugal na Espanha Arabe. Piero Vaz de Carminha – A letter to el Rei D. Manuel I (the writings by a Portuguese knight about Lisbon and the conquest of Brazil). Antonio Augusto Coelho – Estudios de Historia do Portugal. Jaime Cortesao : Infante de Sagres or A Carta de P. Vaz Pinto ...or Alcasarias or Poemas Escolhidos. Auzacho Osberno – Cronicas da Historia do Portugal. Habeeb Salloum, author of five books and numerous articles on Canadian, Arab and Latin American history, travel and culinary arts - a Professor at Toronto University. Gilberto Freyre, a Brazilian sociologist, his book The Masters and the Slaves (1933) talks of the Arab influences still to be found in Portugal today.